de Jong Dream House: One Room. Three Views. It's been just over one year since we moved in, and most rooms are reasonably "done." 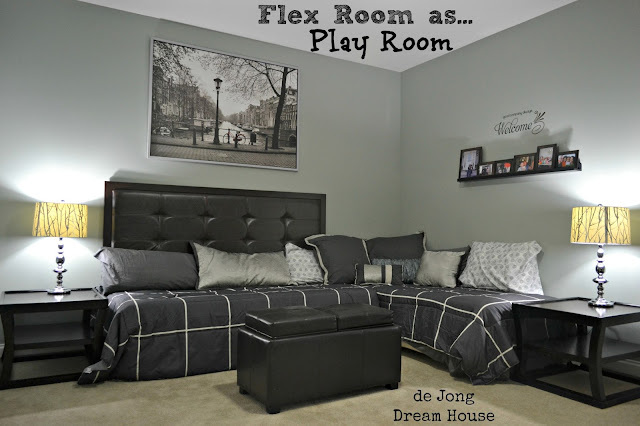 We do have plans to do room tours for each room in house, like we just did with D's bedroom, but several rooms still have a little tweaking to do, or I just need to find the time and energy to write the posts. 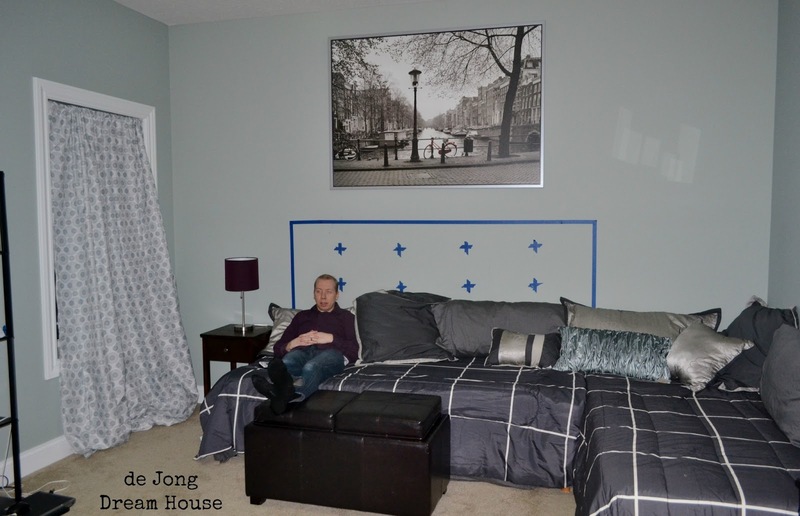 We used the bedding and decor from our old master bedroom. Between the taller ceiling and greyish tint to our green walls, we knew we needed to make a few changes, but sometimes you just need a little motivation. Our motivation came in the form of a sick boy. In the battle of the flu v. the comforter set, the flu won. 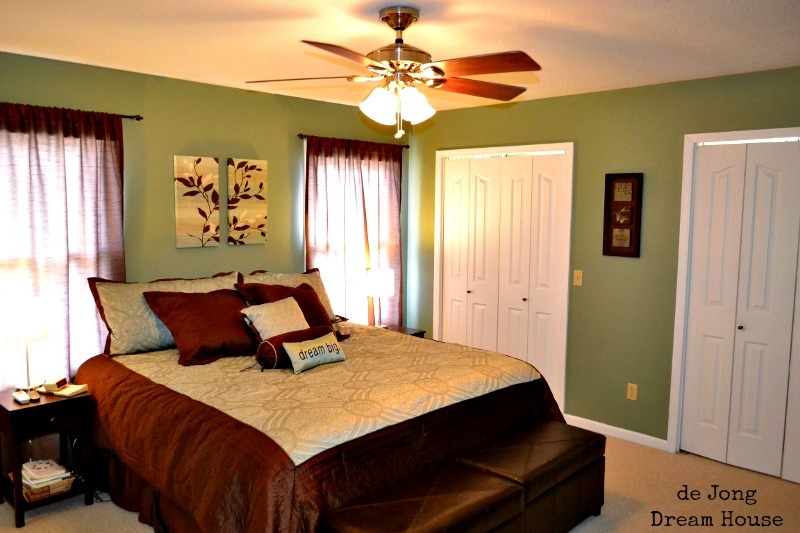 Rest in peace, brown and green comforter set. I found a green and gray comforter set on clearance, which was great, but it really pointed out how much we needed to change the artwork. A little background: we put a master bedroom on the first floor for the convenience of our parents when they visit, and for our convenience when we get older and don't feel like climbing the stairs every day. 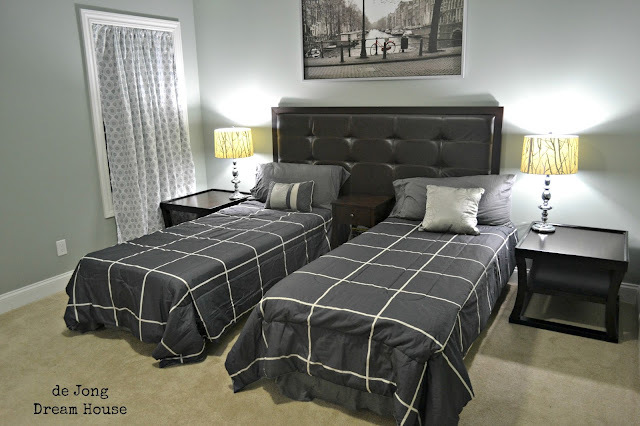 When we have company come, they stay long enough that it's nice for them to have their own space, which the room offers with an en suite, private door to the back porch, walk-in closet, TV, private laundry, and separate heating/cooling zone. Before we moved in, we figured we would mostly keep this room closed except when we had company. But my wise mom suggested we might want to use it as a play room. D is four, and although he plays independently, he loves having me nearby to show me all this creations. So the in-law suite has morphed into a playroom, with one problem. We have a king size bed in the room, which is great for company, but not so great for little boys wanting to build train tracks. Then I remembered that the bed is a European king, which means it's essentially two twins. I also remembered that the Amsterdam print from Ikea would look better in here than Niels' office. And I found a place for the pretty bedsheet that I thought would make a cute curtain. (Tutorial on that to come). Those sheets are my twin sheets from college. Two thoughts. One, I can't believe I still had them because, let's just say there's a big college reunion for me this summer. And two, twin sheets do not fit European kings. 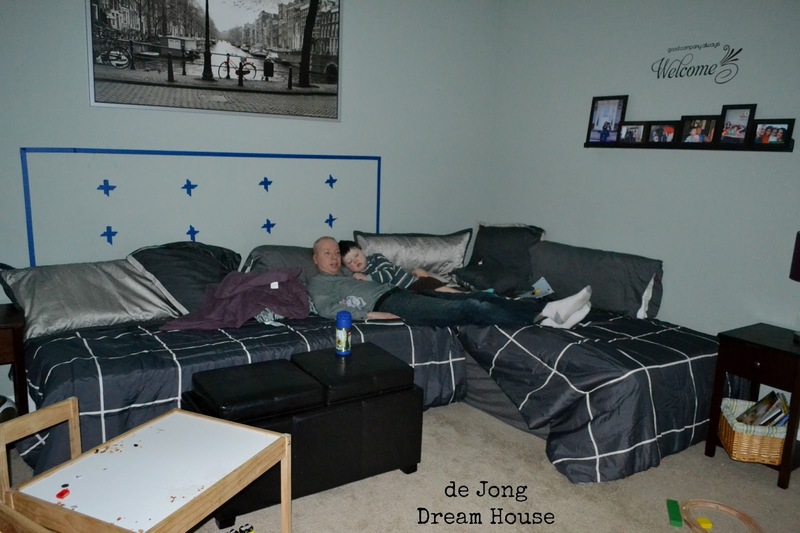 One trip to Target later, we had nice stretchy sheets and new twin comforters on our new "sectional." 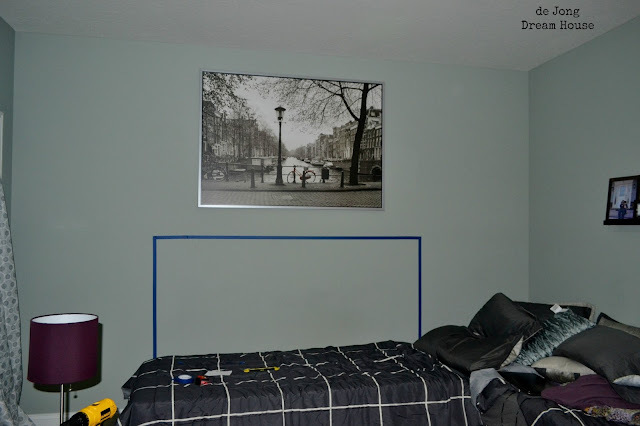 The print was too low when we hung it on the old nails, but we couldn't adjust the height until we made a decision about a headboard. 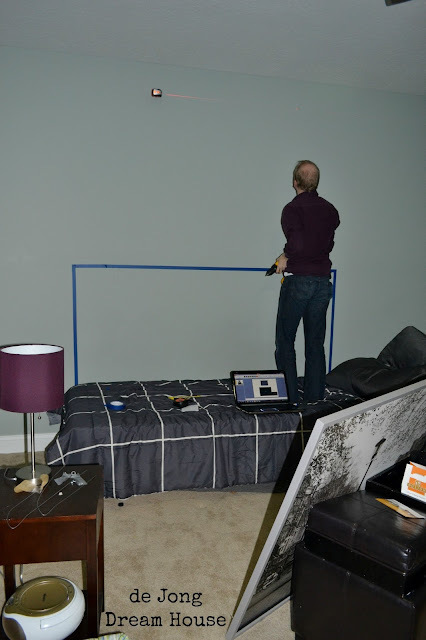 We don't have a headboard in our room yet, but we wanted to get one for this room because we are in it...a lot. We shopped our favorite haunts and found one on clearance at Wayside Furniture. It was just what we wanted for about a third of what we figured we'd have to spent. Love it when that happens. We had a few days before the headboard was ready for pick up, so we made a temporary headboard out of tape so we could put up the print. Because we had a few days, I added tape tufting. Then the flu struck again. I took a shopping spree and found these cool lamps at TJ Maxx. 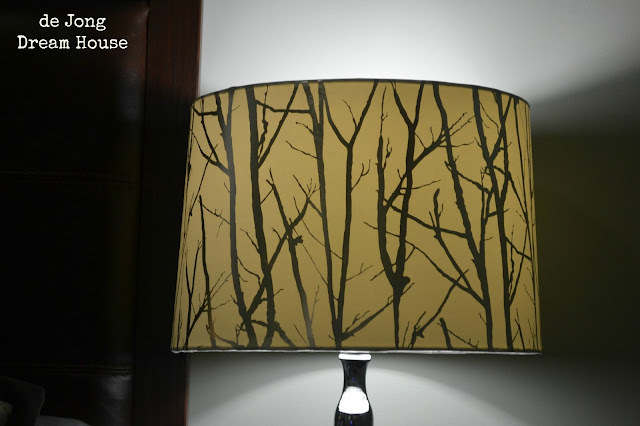 They replaced the much too small and dark little lamp we had before, and inspired us to bring our coffee table (which pulls into two pieces) into the room. 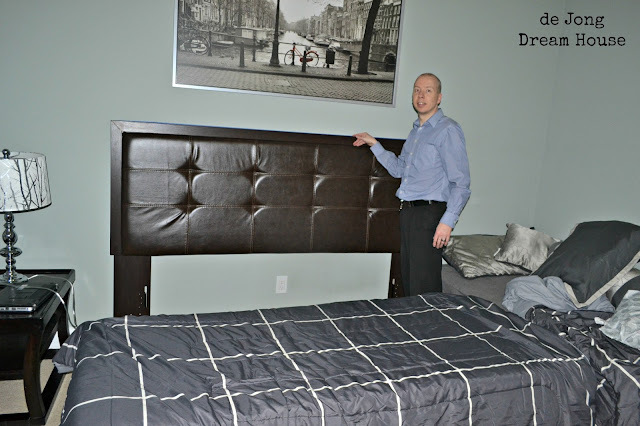 At last, we were able to pick up our headboard. At last, we were able to play dress up with our flex room. The de Jong Resort & Spa is open for business! 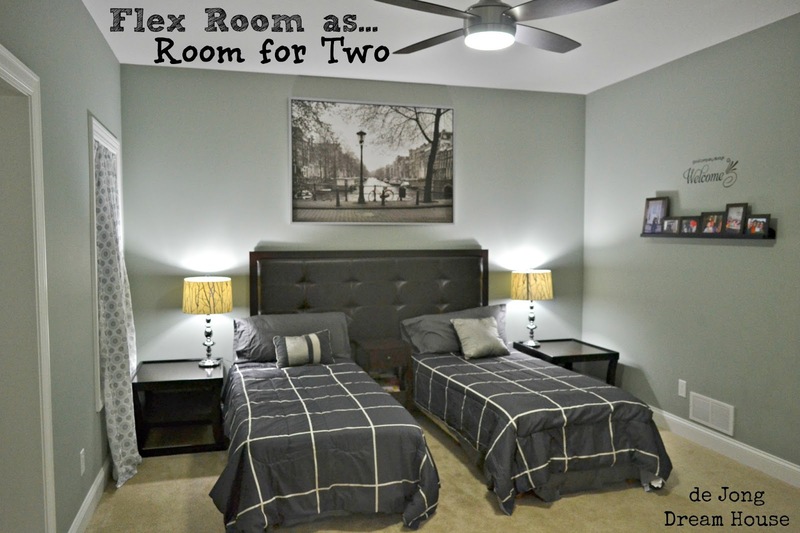 For those times when our guests may not want to share a bed. Our new default setting. Plenty of room for trains and Legos. Lots of space for family movie nights. I wonder who will be the first guests in the "new" room? 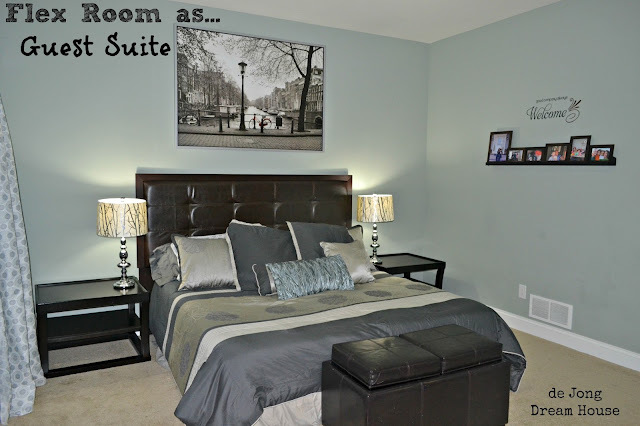 It's fabulous - what a brilliant way to create a versatile guest room! Big big tap on your back ( s ) for this one! Thanks so much! Isn't amazing how the best ideas always seem to come in the middle of the night? LOVE how creatively you two arranged this space! Now THAT is efficient. Thanks for sharing your journey with us! I love that! 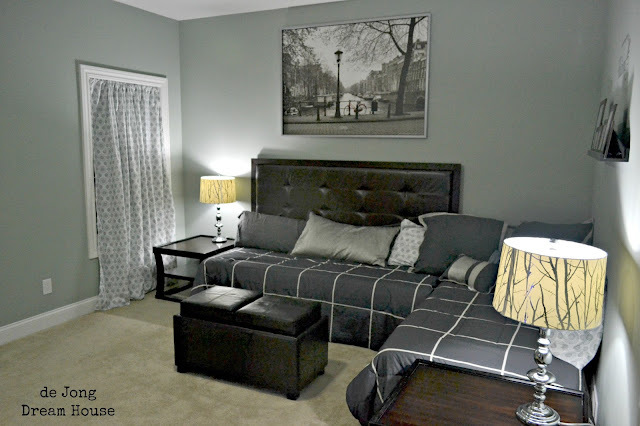 You've done a wonderful job making one space have three different looks - well done! Thank you! I can't believe how easy it is to make our room truly flexible. How Versatile! That's so great you can use the room as it suites your needs! We are getting a LOT of use out of this room now. I'm posting from there, actually! What a smart and functional room! 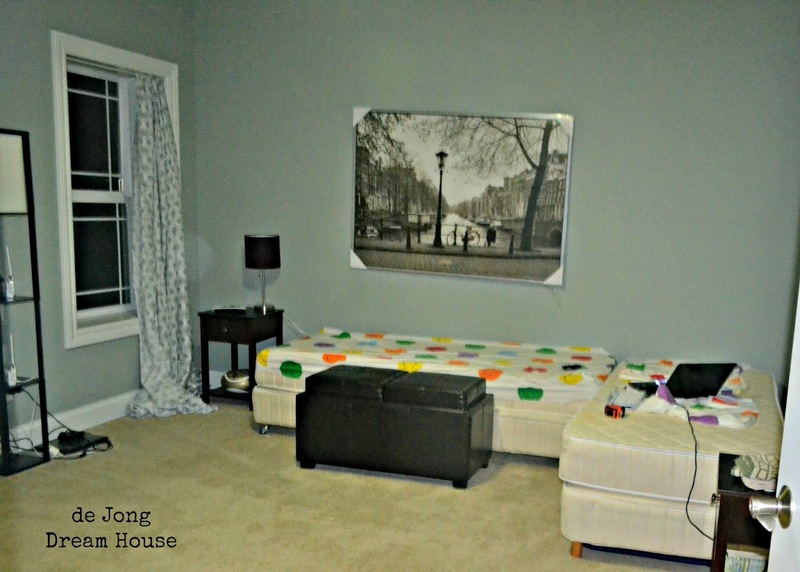 I love the sectional set up, and I think my kids would make it their hang out AND their sleeping quarters! Way cool and so clever! Thanks for linking up to my February Project Party! lol...it is the most popular room in the house now! Such great colors and decor. I think I love it every way. This has given me quite a few ideas for our guest bedroom! Thanks! I glad it inspired you. Come back and link a photo to your bedroom when you're done. Great Idea. I'm pinning it. What a great functional space with so many uses! Way to go! It was definitely one of those "duh, why didn't we do this before" things! WOW Jen. You did a fantastic job. It looks great. I have to pin it. Hi...just stopping in from New Nostalgia. What a great use of that room! Love it! Thank you for linking up to The CSI Project. 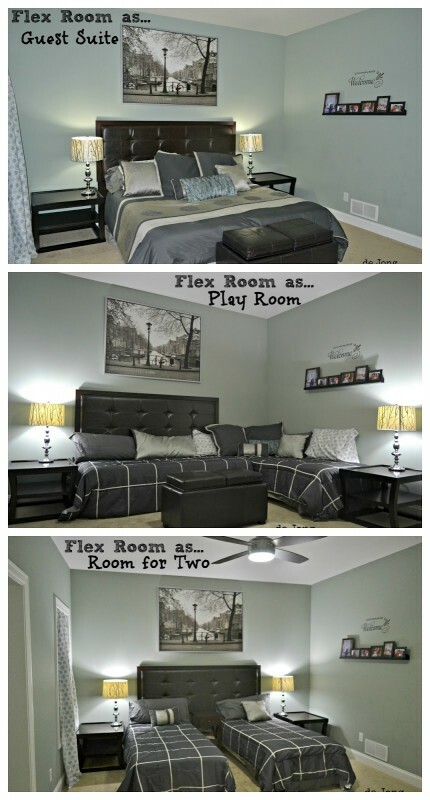 I love that you can easily change the room depending on what you need it for. Looks great. how cool that you can switch it up like that!! 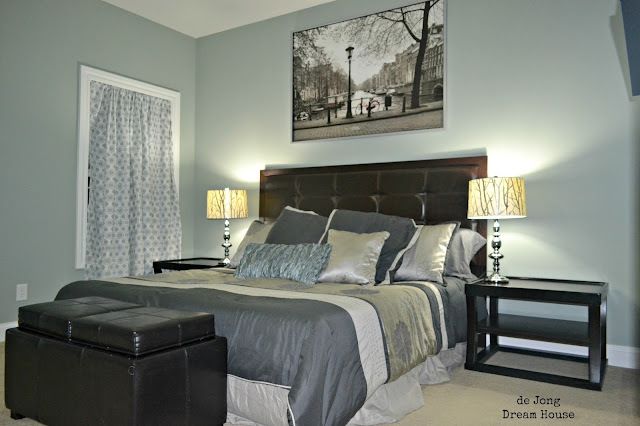 and I love the green/gray color combo on the comforter!